Open Cell Spray Foam is the best value when it comes to spray foam insulation. When it is sprayed, it fills every gap, crack, and crevice effectively sealing off unwanted airflow. Open cell spray foam, like most spray foams on the market, is a two-part polyurethane plastic insulation that is manufactured on site. It requires specialized equipment and trained professionals to be installed correctly. Air sealing is open cell spray foams real advantage over regular fiberglass or blown cellulose insulations. Modern building codes are requiring builders to provide insulation and an air barrier in construction projects. Open cell fulfills both requirements in one, cost effective pass. Most open cell spray foams have an R-Value of 3.5-4~ per inch. This R-Value doesn’t tell the full story of its effectiveness: once again, air sealing provides the real benefit. 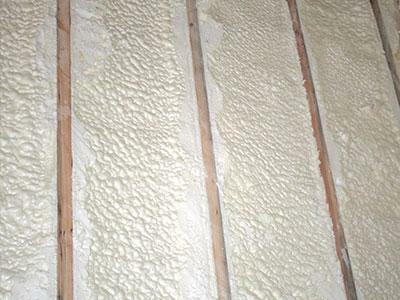 Walls, attics, rim joists, garages and pole barns are a great fit for open cell spray foam. 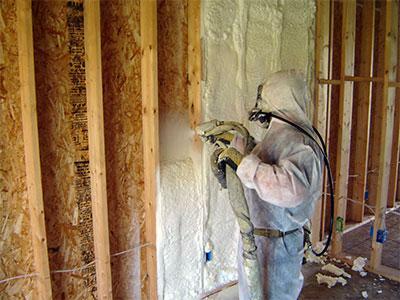 We generally use open cell spray foam in above grade, interior applications only. Not only does open cell spray foam work great as both an insulation and air barrier, it is great a reducing sound transfer. We have utilized open cell spray foam in home theaters, bedrooms, laundry rooms, offices, and between floors to reduce sound transfer. Many customers comment after installation how quiet their home is. Another advantage of the air-sealing capabilities of open cell spray foam is that it can reduce the amount of dust and pollen getting into a home. Customers have reported they do not have to dust their homes as frequently because of this. Many other spray foam companies will bash open cell spray foam making false claims that it will absorb moisture with it’s lower R-value in comparison to closed cell spray foam. However, open cell spray foam will not magically absorb water, similarly to a kitchen sponge on your counter will not absorb water without being placed in water. Most of these companies making these claims only sell closed cell spray foam. As little as 4 inches of open cell spray foam can reduce heat transfer by 94.72%. Unlike fiberglass or blown cellulose insulation, open cell does not need to be 12-14~ inches thick to in attempt to overcompensate for their lack of air sealing capabilities.